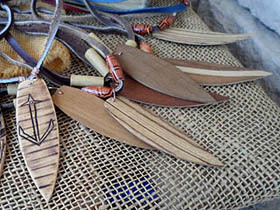 We have wooden surfboard necklaces for sale in South Africa. 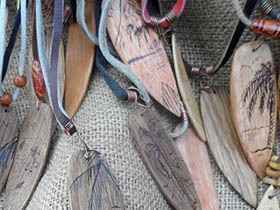 Our handmade wooden surfboard necklaces for sale in South Africa are made by ourselves, Terry and Tony, owners of this beachy.co.za website. 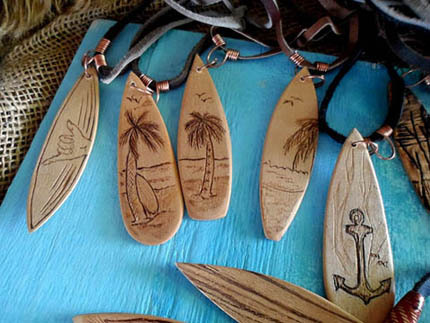 Wooden surfboard necklaces is just one of the handmade items we sell online, and at local weekend craft markets in East London in South Africa. 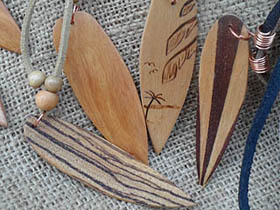 We make our wooden surfboard necklaces from various different woods (whatever type of woods we have available at the time) or from layers of wood veneer. 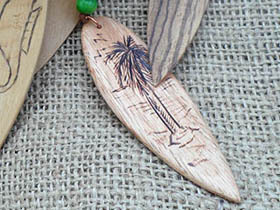 We do not add a skeg to our handmade little boards. 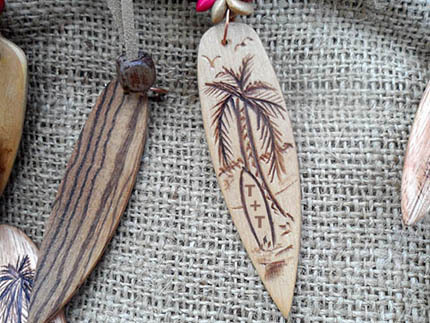 Our handmade wooden surfboard necklaces are water resistant, but not waterproof. 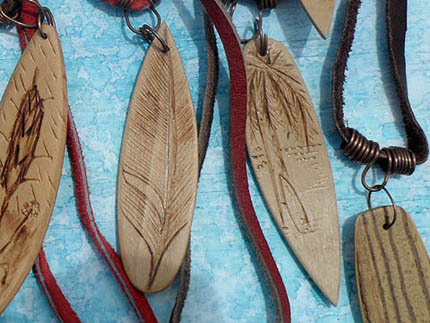 Do not wear these wooden surfboard necklaces while swimming, surfing, or showering. Do not leave them outside in the rain. 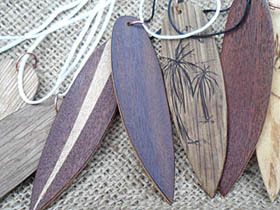 We can make other requested custom sizes, but, generally, each small wood surfboard is 8cm long. 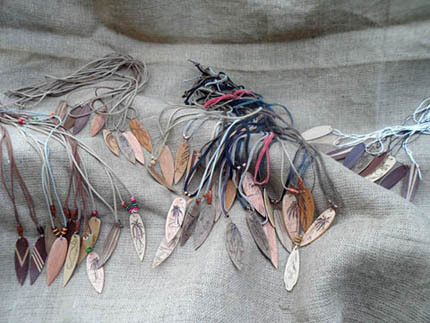 You can also request that we do not add a necklace cord, just the copper wire jump-ring, and you can add your own necklace cord, chain, ribbon, thread of your choice, or key ring. 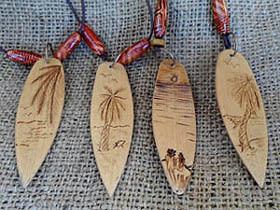 Each small wood surfboard is cheaper if there is no necklace cord. 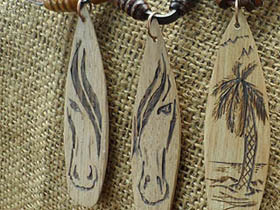 See the price list further below. 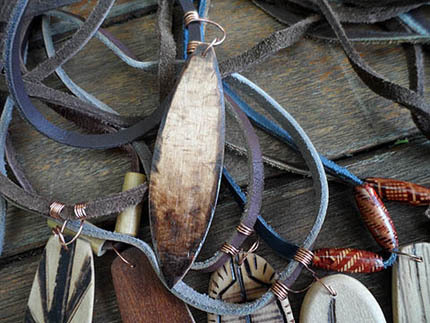 For the necklace cord we usually use real leather or waxed necklace cord. 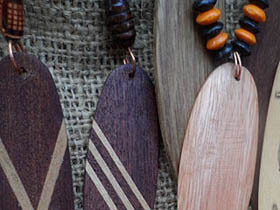 We use a sliding knot in the necklace cord, so that the length of the cord can be adjusted to suit different tastes, or so that our wood surfboard necklaces can be worn by both young children and adults. 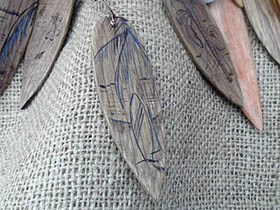 Any images on our small wood surfboards are wood burned on by ourselves. 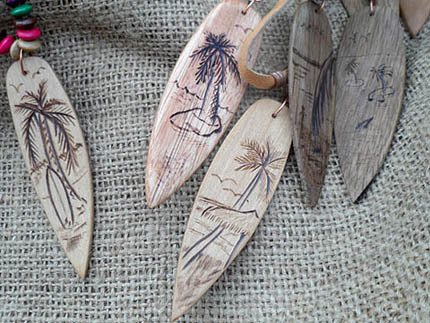 Our most popular type of wood burned image on these small wood surfboards is an ocean or beach scene depicting a palm tree or palm trees. 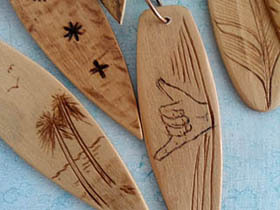 You may request custom simple images that may mean more to you or to the person receiving one of our small wood surfboards as a gift, than our usual images of palm trees or our other images may mean to you or them, as long as the requested drawing is nothing too complicated. 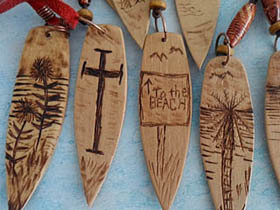 You may also request that we wood burn a name or two names onto the little boards, as long as the names are not too long – this idea may be perfect for wedding favours for a beach wedding, or for giving as a gift for a 13th birthday or 21st birthday, or for loving “beachy” couples who want to wear each other’s name around their neck. 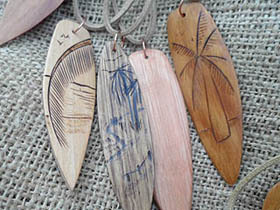 We usually have a few wooden surfboard necklaces in stock at any one time. 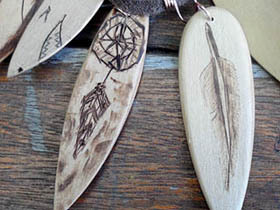 You can let us know how many you want, we can photograph a few, send the photos to you via email, and you can select your favourite ones. 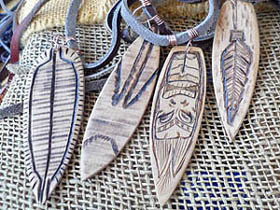 Prompt payment secures your selected wooden surfboard necklaces just for you. We post only on a Friday, from Postnet in East London in South Africa to another Postnet in South Africa. It takes 2 to 4 business days for the parcel to reach a South African Postnet near you. 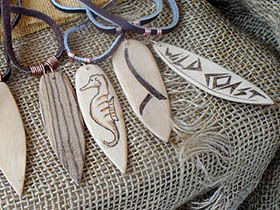 Postage is R99 and handling and packaging is R30. 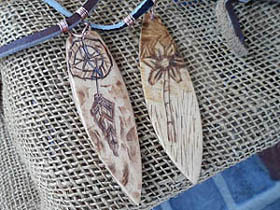 See the price list of the wooden surfboard necklaces further below. 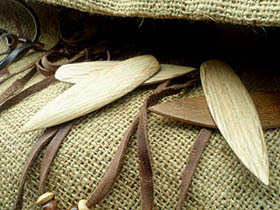 Unless we already have in stock what you might like, and enough of them if you want more than just one or two, they take some time to make. Please order well in advance of when you need them. 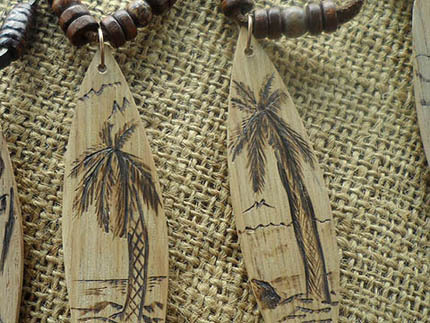 Buy wooden surfboard necklaces in South Africa – from us – for yourself, as gifts, as wedding favours for your beach wedding guests, or for reselling in your South African surf shop, beach resort shop, gift shop, or at a flea market or craft market. 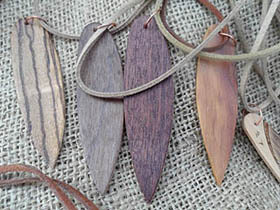 Order plain light colour wood ones if you would like to decorate, paint, or draw on them yourself.